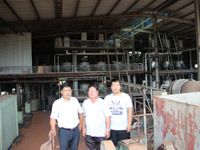 Mr Liu Hao (right) and Mr Vonesavad Boutnasone (centre) stand in front of the Hinheup Cassava Flour Factory. Since the factory opened six years ago in Naphong village, Hinheup district, it seems that the demand for cassava flour, or tapioca, is on the rise and the factory’s single machine is no longer enough to produce sufficient for customers’ needs. The factory is on an 80-hectare site. The factory owner decided to buy a new machine with the aim of doubling output from 38 tonnes of tapioca to almost 70 tonnes a day. The plant’s Deputy Director, Mr Vonesavad Boutnasone, said one of their first tasks now is to encourage the local villagers to grow more cassava. “In this way, local people will benefit from our business growth,” he said. The factory will not only promote cassava cultivation in Hinheup district, but will also encourage people to grow cassava in Meun and other districts in the province. The factory will supply cassava seeds and then buy the crop in eight months’ time when it has been harvested. This means people can earn extra income and gradually improve their living standards. In one day, one processing machine can turn 150 tonnes of cassava into 38 tonnes of flour. In addition to encouraging villagers to grow more cassava to supply the factory, the plant employs more than 300 local people. Each worker earns from 1.5 million to more than 2 million kip depending on their work experience. The factory also has welfare policy that provides benefits for its employees in the event of an accident in the workplace. To sustain the factory’s output, the management takes the immediate environment into account and recycles all of the waste produced. Some of the waste material is made into fertiliser for use by farmers. The waste matter is also treated to ensure it does not give off any bad smells. It cost about US$5 million to set up the factory in a joint venture between Chinese and Lao companies. To ensure output matches market demand and products meet consumer health requirements, district and provincial authorities conduct regular checks of the factory’s production process. The quality of the factory’s tapioca is made evident to the public when products are displayed at district fairs to promote tapioca in the Lao market. Director of the Hinheup Cassava Flour Factory, Mr Liu Hao, said he wanted to thank Lao authorities at all levels for recognising the importance of foreign investment. They always smooth the way for us, especially when we need them to complete legal documents relating to the factory, he said.